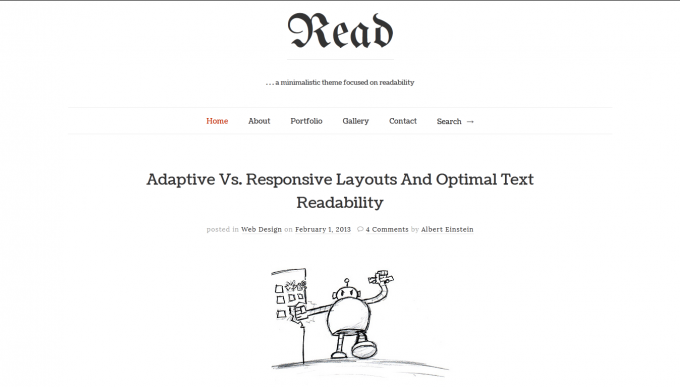 ‘Read WP’ is a gorgeous WordPress theme that is suitable for great blogs. This theme is an excellent choice for personal blogs with remarkable content and ideas, because it is designed with a focus on the readability and the pleasant browsing experience for visitors. ‘Read WP’ has elegant minimalist design with a responsive layout to be beautiful and functional on all mobile devices and displays. It supports all post formats and provides 3 options for blog layout – Standard, Sidebar and Masonry. There are more than 600 Google Fonts at your disposal. Read WP is Retina ready and translation ready. It is social friendly with over 20 social icons available on the theme. It is compatible with the most used SEO plugins and designed to be accepted and “liked” by the search engines.